I’m trying to eat my way around the world without leaving London and this week I went to have Albanian food in Maida Vale at Alba Grill. Alba is London’s one and only restaurant that sells Albanian fare. I was a bit earlier than my table partner and was really looking forward to having a glass of wine after what had been a gruesome day at work. Contrary to what the bottles of wine and hard liquor on display suggested, Alba doesn’t have a liquor licence, at least not yet, so I settled for a glass of ayran which is a yogurt drink, apparently an Albanian favourite. While I enjoyed my refreshing glass of the yoghurt stuff, I had a good look around. Alba doesn’t look like a fancy place at all. It actually looks rather like a fast food and takeaway place. The décor is a little bare and doesn’t really make you want to have one of those evening filling dinners. Especially with no booze. The owner on the other hand, was enormously friendly and very keen to chat. By the time my friend arrived we had practically become BFFs. When we came to picking our food, we felt a bit lost in translation. We must have looked helpless as the owner came to our rescue and suggested we’d go for the mixed grill platter for 2. An excellent suggestion. The platter was huge and contained succulent grilled chicken fillets, chorizo like sausages, lamb minced sausages. There were also generous blobs of tzatziki and red pepper and feta paste., some green peppers and a tomato salad. 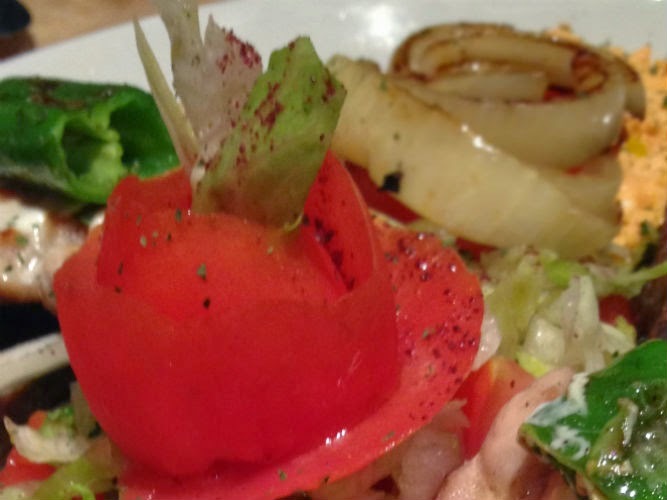 Topped with a skilfully cut, rose shaped tomato. There was so much food, we were not able to finish it between the two of us. I loved Alba for its food and its friendly owners. It felt like a real homely place. And if you do want some booze to spice up the evening, there are loads of pubs down the road.